80 • RV PRO • March 2019 rv-pro.com "I've done a lot of research. There are about five locations in Colorado, as far as RV dealers, that have paint booths," he says. "If I was a car dealership, there's no way I would look into a paint booth because it's too regulated. The insurance companies sit there and say, 'OK, we're going to say it's a half-hour job,' but in reality, it takes an hour. With RVs, they don't know what to do and what's nice is that I'm very upfront and honest … if it's going to take us two hours to do it, that's what we'll charge." Mericle partnered with FinishMaster, a national automotive paint distributor, to provide the booth's funding. Given that his research showed Camping World and Lazydays paint booths are booked seven months out, Mericle is confident his facility will begin earning revenue quickly. His service manager, whom he hired in late January and oversees a shop foreman, five technicians and a service writer, previously ran a paint shop for more than a decade. Very rarely do the parts and service departments contribute more than 10 percent of a dealership's revenue, but again, Mer- icle stands that idea on its head, especially given that his parts store hasn't really taken off yet. "Our service is about 30 percent of our revenue right now just because there's such a huge need for it now," he says, noting his service customers have become tired of waiting for appoint- ments at other dealerships. "We're two-and-a-half months out." The reason for that is two-fold, he says. 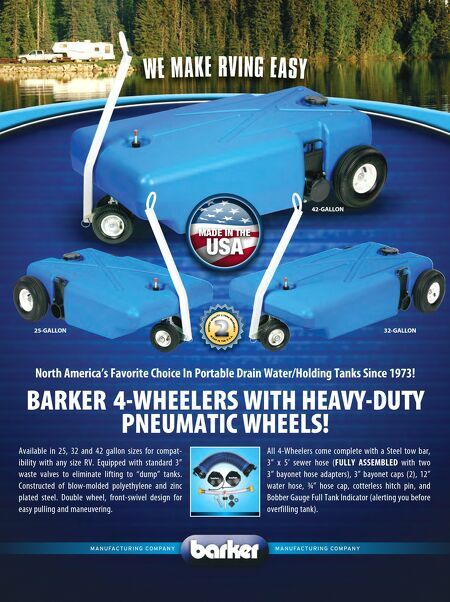 First, his store is a preferred service center for Jayco and Thor, so his service staff accepts owners of those products as well as Mericle's own cus- tomers. Second, he simply doesn't have enough technicians. "I have a really backward thinking when it comes to hiring people. I don't like to hire them from the industry because there are so many that jump dealerships constantly. It's hard to find really good help," he says. Instead, he looks for candidates with backgrounds in plumbing, electrical, carpentry, as well as bodywork and paint, developed outside an RV shop. One of his recent hires, who has experience restoring muscle cars, is doing PDIs, deliveries, roof replacements and electrical work. Of course, he worked under the guidance of a 28-year RV technician, Mericle says, and someone with that amount of experience is invaluable. Success Selling Truck Campers Another example of swimming against the current: Mericle RV's success retailing truck campers. It's a polarizing category for dealers across the country. Many simply won't touch them when sure-fire sellers such as travel trailers that appeal to more customers can occupy practically the same space. Yet Mericle averages almost six truck camper sales a month. So how did he make that happen? "It was completely by mistake," Mericle says. "So, we had a customer in January of last year who called us saying, 'Hey, I was on Travel Lite RV's website. 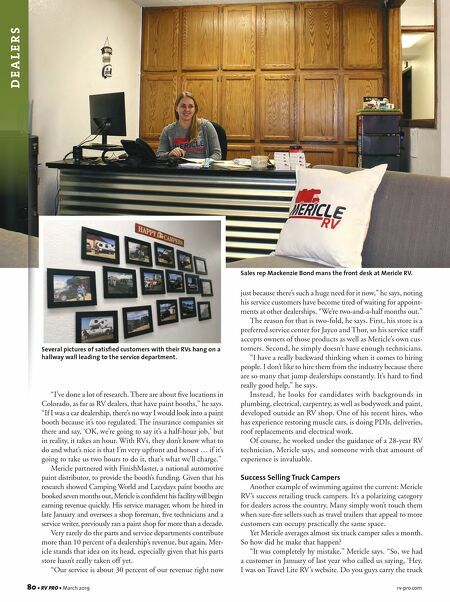 Do you guys carry the truck D E A L E R S Sales rep Mackenzie Bond mans the front desk at Mericle RV. Several pictures of satisfied customers with their RVs hang on a hallway wall leading to the service department.